The buckler makes a historically popular shield due to its maneuverability and uses for blow deflection, hand protection, and more. The Woodgrain LARP Buckler features a hand-painted wooden pattern design with a metallic central dome. The round LARP shield is crafted from hard EVA foam and coated in latex for strength and durability. A leather brace and hard foam create the handle for gripping. 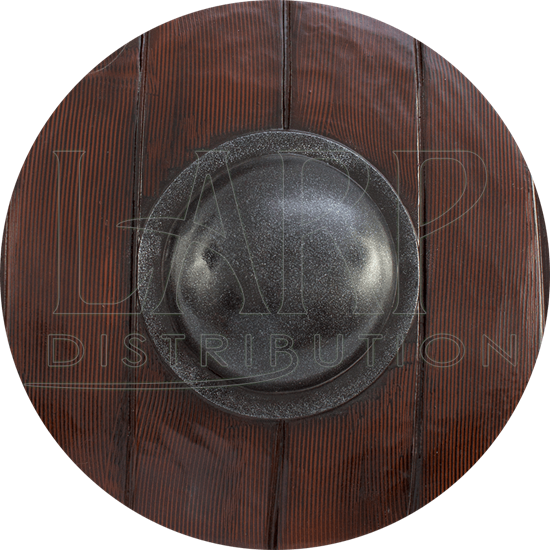 This latex buckler makes a great choice for protection, especially for medieval and Renaissance fighters who want an authentic period look. This shield has an average diameter of 16 inches. Please be aware that this measurement can vary slightly as it is a hand-made item.